To create this book I hired a guide and a small boat and we travelled up the river each day to search for orangutans. It was a struggle hiking through the jungle. I was always covered in mud, and I didn’t like the leeches. But my reward was seeing orangutans swinging through the trees with their bright red hair catching the light. One day a dominant male charged at me, so that was very dangerous. But my guide kept me safe. I spent hours taking photographs of a mother and baby by the water’s edge. I was surprised when I saw a female orangutan go into the river and play in the water. Sometimes animals help me write my book when I observe their behaviour in the wild. I made special arrangements with scientist Dr Birute Galdikas, who runs the care centre at Kalimatan Tengah for orphaned orangutans. Holding a tiny baby orangutan was a wonderful and touching experience. 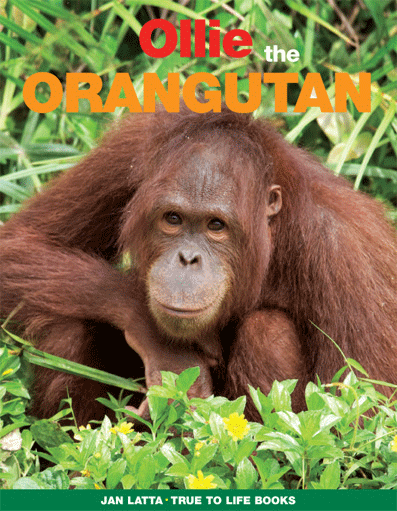 The concept for the book is the orangutan talking to children about its life in the wild and how it can survive. There are maps, interesting facts and fun activities. See this video of orangutans in the wild.